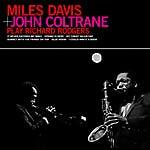 Down At Dawn present Miles Davis and John Coltrane's Play Richard Rodgers, originally issued in 1963. Play Richard Rodgers is a collection of some of the most beautiful songs by the great Broadway composer Richard Rodgers, interpreted by jazz giants Davis and Coltrane. Play Richard Rodgers is a stand-out set of classic tunes from the great American song tradition, performed by the two legends with sidemen including masters such as John Lewis, Red Garland, Tommy Flanagan, Paul Chambers, Percy Heath, Jimmy Cobb, Philly Joe Jones, and Roy Haynes. Edition of 300. 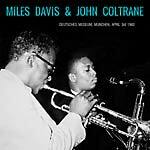 Doxy release a great show from the legendary Miles Davis and John Coltrane 1960s European tour. Spring of 1960 was a major turning point for the Miles Davis Quintet. Seven months after the release of Kind of Blue (RUM 2011129LP) in August 1959 and just days after Miles recorded Sketches of Spain (DOG 904LP) on March 10 and 11, 1960, the quintet departed for a breakneck tour of Europe. Tensions ran high even before the quintet left, and major changes would take place upon the group's return, including the departure of John Coltrane. Coltrane's solos are at times playful and harmonically complex as is his signature, stretching the boundaries of the themes and in fact the genre, and always interesting. There are clear signs of the direction he would soon take on his own as a leader. Miles Davis himself plays some of his finest breaks in this set and clearly is inspired by the material and the band and very probably the rapt audiences. It's clear they knew they were witness to giants in their land and showed due respect and generosity. 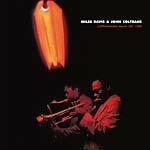 What makes these recordings so special is that you can hear Coltrane starting to break away musically, taking extended "sheets of sound" solos on Miles Davis Quintet standards. Whistles of admiration and encouragement go up from the audience during Coltrane's solos, and you get the sense from Miles's playing that he was being topped and wasn't quite sure how to respond musically. An astounding performance by the Miles Davis Quintet, including John Coltrane, recorded live in Copenhagen. This is one of the few 1960 recordings by the legendary formation in its only European tour, before Coltrane's departure to form his own band; one can hear the master musician just on the cusp of breaking forward to his more progressive-leaning phase, while still completely rooted in tradition. A must-have!